Remember that fried chicken commercial from years ago? Well it just popped into my head. I digress, back to the business of the pie. Mom has a pear tree in her backyard. It had not beared fruit for some years. After a pruning last fall, this year she got some great fruit! She managed to get just enough pears off the tree at the end of the season to make a pie. So why did I help? Well, I showed up unannounced at Mom's, in the middle of her making it, threw off her concentration and she put it aside to get back to it later. Well, when later came, she was not in the mood to make it anymore until I insisted I would help. So we both got to it. She finished making her famous crust and I prepared the filling. It was fun, just like old times when I was a kid, trying to help mom. Squeeze lemon juice into a large bowl. Peel, slice and core pears, dropping them into the bowl with the lemon juice. Add corn starch, 1/3 cup sugar, cinnamon, nutmeg and raisins. Mix well and set aside. In a medium bowl mix all ingredients (except 1/4 tsp. sugar and milk) together with a fork adding additional water if necessary. Form 2 balls, wrap in plastic and place in the refrigerator until ready to roll out. About 20 minutes. In between 2 pieces of wax paper roll out each ball of dough, rotating to create a 11-12 inch circle. Remove top piece of wax paper, flip over and place in a greased pie plate. Remove remaining wax paper. With a fork, lightly indent entire crust. Pour pear mixture into prepared pie crust. Remove wax paper from the top of the second crust and form slits in the center for steam to escape. Flip over crust and cover pear mixture. Carefully remove remaining wax paper. Seal and crimp edges. Brush the top of the pie crust with milk and sprinkle with a 1/4 teaspoon of sugar. Place pie on a foil lined baking sheet. Bake for about 15 minutes at 450 degrees, then reduce oven temperature to 350 degrees and bake for an additional 45 minutes to 1 hour, or until crust is golden brown and the juices are slowly bubbling. Ooooh! A pear tree....that is so cool. I want one. What type of pear is it? 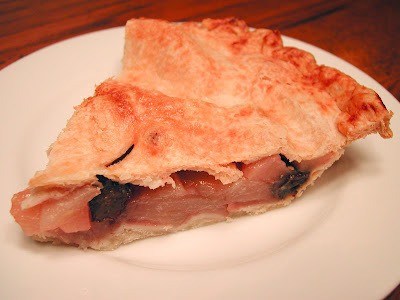 I like the idea of pear pie, but when I made it, my family thought it was weird. So, I'm glad pear pie is a normal thing. I will have to try the pie crust recipe. Does she use butter flavored shortening? Brilynn, Well if I was close by I would give you some, sorry! Bambola, Yeah your right and it's more fun too. Emilie, I'm not even sure what kind of pear it is. The tree has been there for many years and we never really knew the variety. She uses plain ol Crisco shortening and swears by it. She says the butter flavor is too fake!